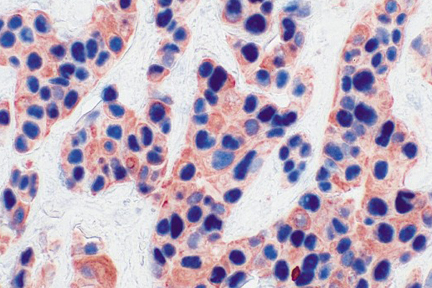 Tumor (double label): Cytokeratin, VECTASTAIN® Elite® ABC Kit, Vector® NovaRED® (red) substrate. 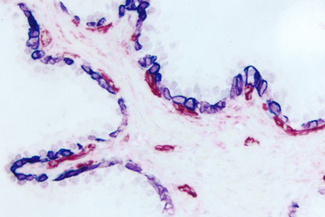 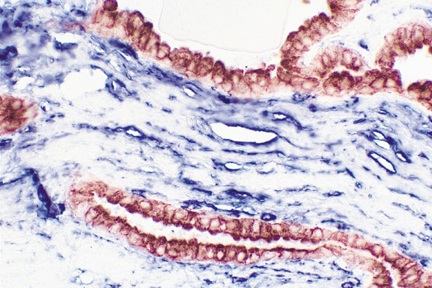 CD34, VECTASTAIN® ABC-AP Kit, BCIP/NBT (blue) substrate. 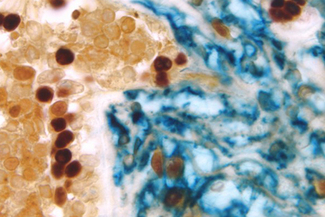 Breast Carcinoma (triple label): Estrogen Receptor (m), VECTASTAIN® Elite® ABC Kit, Vector® NovaRED® substrate (red); CD34 (m), VECTASTAIN® ABC-AP Kit, Vector Blue™ substrate (blue); Cytokeratin 8/18 (m), VECTASTAIN® Elite® ABC Kit, DAB substrate (brown). Prostate (double label): Cytokeratin (m), VECTASTAIN® ABC-AP Kit, Vector Blue™ (blue) substrate. 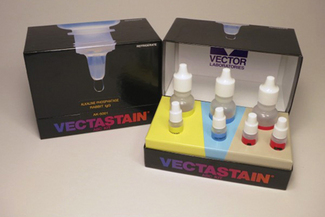 CD34, VECTASTAIN® ABC-AP Kit, Vector Red™ (red) substrate. Tumor (double label): p53 (m), VECTASTAIN® ABC-AP Kit, Vector Blue™ substrate (blue); Multi-Cytokeratin (m), VECTASTAIN® Elite® ABC Kit, AEC substrate (red).